A spunky, fiery redhead, Mindy Leher spent her childhood days skiing the slopes of Vail, attending concerts at Red Rocks, and cheering on her beloved Broncos. She was a young girl with dreams and aspirations as big as the Rocky Mountains in which she lived. Her passions were twofold-this future entrepreneur wanted to spend her days playing sports and her nights creating art. Mindy’s athletic prowess rivaled John Elway’s ability to win Superbowls. As an athlete, Mindy served up aces on the tennis court, drained threes on the basketball court, and dodged defenders on her way to scoring goals on the lacrosse field. As an artist, Mindy spent snowy Denver days painting murals on her parents’ basement wall and sketching renderings of her favorite celebrities-Madonna, Michael Jordan, Stevie Nicks and Dave Matthews, to mention a few. Upon graduating from Englewoods’s Cherry Creek High School, Mindy packed up her lacrosse stick, loaded up her drawing tools, and bottled up her mountainous spirit to venture Eastward to the Shenandoah Valley in Virginia. Sure, “Virginia is for Lovers,” but it was also meant to be a temporary home for this ambitious and artistic athlete. As a member of James Madison University’s nationally ranked lacrosse team, Mindy spent her days lifting weights, running sprints, and winning championships. At night, however, she retired her cleats and fired up the torch to design jewelry, manipulate clay, and paint on canvas. After four years of enduring this rigorously satisfying schedule, Mindy graduated with a degree in Sports Management, with minors in Graphic Design and Studio Art. As always, Mindy combined her competitive drive with her flair for the artistic to achieve personal and professional success. After a minor stint of collegiate coaching and travels that took her to Virginia Beach and Annapolis, MD, Mindy was finally able to hone her future craft and immerse herself into her life’s passion. She focused her energies on completing an independent study in jewelry making, while simultaneously creating signage for a local female owned and run sign shop. The aforementioned experiences inspired Mindy to pursue her own small business opportunity-as a result, Red Dog Glass launched in January of 2004. 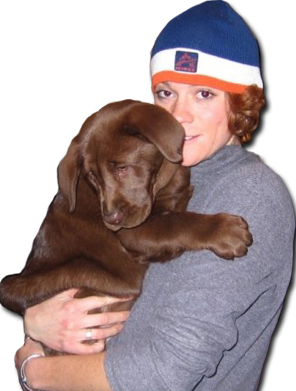 With her chocolate Labrador, Cova, at her side (Cova is short for both CO-Colorado and VA-Virginia, Mindy’s two beloved homes), Mindy was ready to share her glassware and signage with her extended family, including former teammates, satisfied customers, and future friends. Mindy now works out of her home in Collingswood, New Jersey, a quaint town a mere 10 miles outside of historic Philadelphia. Five years later, Red Dog Glass has expanded to include sandblasted glassware, mirrors, jars, canisters, and dog bowls (for Cova’s friends). Red Dog Glass services local businesses by providing signage and logos for the charming shops on Haddon Avenue in Collingswood and in and around the entire Tri-State area. Mindy’s passion for all things artistic and athletic has become her life’s work; John Denver would surely be proud of this Rocky Mountain Redhead!